The development of the fashion show, with in-house models posing for customers as early as 1850, until today’s catwalk craze is a long and meaningful story. I have picked out some quotes from Caroline Evans‘ article The Enchanted Spectacle, and I’ll try to sum it up for you guys. The fashion show has played a key role in the development of the modern fashion industry. From approximately 1900, fashion shows began to be staged in couture houses and department stores and as charity fund-raising events in Britain, France and the USA. As „the theatricalisation [sic] of fashion marketing“ par excellence (Kaplan and Stowell 1994: 117) the fashion show also has a relationship to art, theater and film; to consumerism; and to the commodification and eroticization of the female form in mass culture; in short, to the wider formations of gender, image, desire and commerce in the twentieth century. the fashion show can be understood both in the context of commerce, and in the context of the late-twentieth-century concern with image and identity. For our identities and identifications are framed and given shape by the context of commercial relations, and fashion is a modern paradigm that brings together commerce, culture and identity in a particularly (post)-modern formation on the runway. From the beginning of mass-consumption, individuals have looked at the models and dummies in shop windows to define themselves. The rise of the model, and the fashion show, are directly linked to the rise of mass production in the wake of industrialization; living mannequins were first used in the nineteenth century, and they began to model in fashion shows at the beginning of the twentieth. When the haute couture houses began to show their clothes on live models, these figures were mirrored by the dummies of the department store windows. Such images of spectacular women are linked to a confusion between, on the one hand, the fetishism of the commodity and, on the other, the commodification of sexuality in the form of the increasing visibility of women as spectacle in the nineteenth century and early twentieth century (…) Yet to understand the fashion show solely as a symptom of the objectification of women is to miss its complexity, for the fluid and theatrical space of the catwalk simultaneously permits the modeling of gendered identity as a cultural construct. For the opening night of the American mannequins‘ debut, Patou sent the entire cast — French and American alike — out in single file wearing only the thin cotton peignoirs worn between fittings, a tactic that caused laughter and applause. This parade of 20 identically dressed mannequins is a trope commonly used in the rhetoric of the modern fashion show. The visual shock tactic is often deployed in the contemporary défile, the parade of all the models down the runway at the end of the show. Fashion, supposedly about individuality, is actually about uniformity, and designers like Miyake have fruitfully exploited this contradiction to dramatic ends. The body that is produced is a disciplined, streamlined and modernist body, in which the outer discipline of the corset has given way to the inner disciplines of diet and exercise. In the 1920s both Chanel and Patou designed for a body that conformed with the modernist aesthetic, which was functional and anti-decorative; this body was, and continues to be, „produced,“ through diet and exercise, very much along the lines of Fordist production. Thus the model embodies a contradiction, which is resolved in her spectacular show presentation: she is at once unique and serially reproducible. 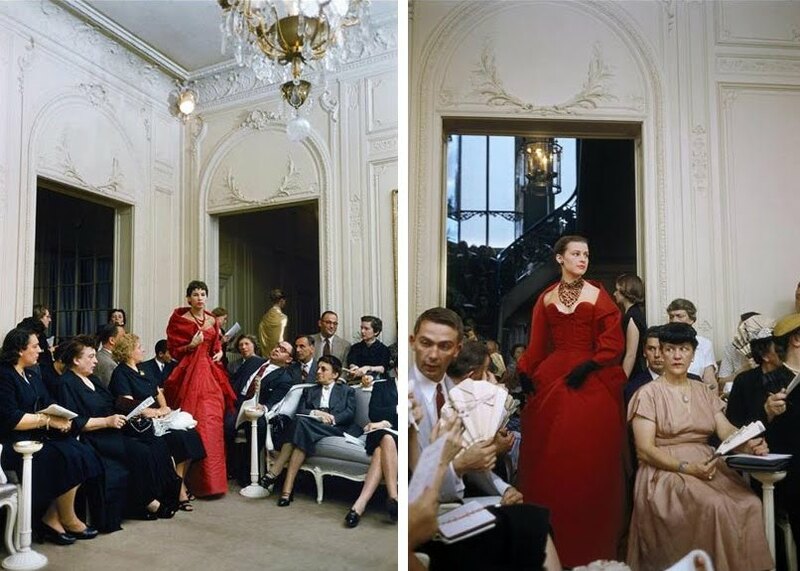 In the 1950s and the first half of the 1960s Parisian couture shows were usually presented in the couturier’s salon, or some other space decorated in ancien régime style. Sometimes Balmain, for example, took rooms in the Hotel Georges V. All the staff tended to wear black. Guests sat on spindly gilt chairs and were given little plates of canapés and champagne. There was no music, only the aural drama of rustle and footsteps as the vendeuse called out the name or number of the garment as it was modeled, first in French and then in English, except at Balenciaga, where silence prevailed and the mannequins simply carried a card with the model’s number in their gloved hands. A little raised platform, or runway, which might be either T-shaped or semicircular, might be built in to the salon as a permanent feature, perhaps with a curtain, or the mannequin might simply walk between rows of chairs arranged in the carpeted salon. There was a strict order of presentation; the final wedding dress today is a remnant of this protocol. [Mary Quant] realized that unless she dramatized her presentation her simple styles would be lost among the more ornate ones being shown. Accordingly she made an impromptu decision to show her collection to jazz music, and rapidly rehearsed the models so that they opened the show in the staid ballroom of the hotel by kicking, dancing, running and jumping, to produce an electric atmosphere. However, the changes inaugurated by Quant and developed by many other designers in the 1960s owed less to changes in the wider culture, although their themes might reflect those changes, than they did to enormous changes in the fashion industry itself. The origins of today’s spectacular fashion shows lie in the 1960s, and are directly connected to the rise of designer ready-to-wear, and its expansion to include menswear. In 1984 Thierry Mugler staged a ready-to-wear show as an enormous spectacle, produced by a rock impresario, with a cast of 50 and an audience of 6,000 (Figure 13). Breaking with the protocol whereby only invited guests attend, Mugler opened the show to the public by offering half the tickets for sale on the open market. This was the first time the general public was ever present at a live Paris show and marked the beginning of the fashion show as mass entertainment. It is in this tradition, of spectacle, excess and showmanship, that one can locate the London shows of John Galliano and Alexander McQueen in the 1990s, and their respective shows in Paris for Dior and Givenchy. McQueen’s models walked on water (apparently), and were drenched by „golden showers“ (Figure 14) or smeared in blood and dirt. Galliano’s narratives were loosely based on a series of spectacular women from the late nineteenth and the early twentieth centuries. For each show he created a fictional character around whom the narrative edifice was built. If the early twentieth century saw the fashion show evolve out of commercial theater, the close of the century saw commercial fashion evolving into an approximation of what the academic Judith Butler has termed „performativity“ (Butler 1990). The fashion show, with its emphasis on novelty and spectacle, became a switching station for postmodern identities. Evans, Caroline. The Enchanted Spectacle. In Fashion Theory 5 no 3 271-310 S 2001. The H.W. Wilson Company/WilsonWeb / Art. Online.